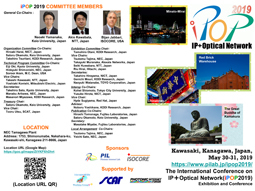 iPOP2019, May 30 - 31, 2019, will be held at NEC Tamagawa Plant in Kawasaki-shi, Kanagawa, Japan. The conference is intended to share among the industry and the academia communities, the knowledge, new findings, and experience on the state-of-the-art of “IP and Optical Networking technologies.” Within the theme, we intend to demonstrate IP & MPLS/GMPLS networks and SDN equipment (IP routers, ODU XCs, Optical XCs, Ethernet switches, MPLS-TP nodes), protocol test equipment/tools, network operation support tools, and other related issues. In addition, we intend to showcase Network Automation and Failure Management empowered by Machine Learning and Leading-edge Software for Network Slice, Data Center Networks, and Disaggregation. The iPOP2019 anticipates a draw of over 300 attendees, made up of network operators, service providers, and equipment vendors. (ipop2019-exhibition@pilab.jp) by March 31, 2019. Exhibit space is limited and will be committed on a first-come first-serve basis. Exhibitors will be obliged to provide electronic data of poster panel by the beginning of May 2019, which will be uploaded on the website of iPOP2019. *1 JPY 100 (100 Japanese Yen)＝$0.90 (0.90 US Dollar) as of Feb. 28, 2019. *2 Desk(s), chair(s), and internet access may be supplied from iPOP 2019.